If you're interested in a career in agriculture, finding a summer farm job may help you obtain useful skills and experience to add to your resume. Because farm work is seasonal, many farms, stables, ranches and agribusinesses seek seasonal help for summer jobs. You can find these jobs in trade newspapers, publications, job search sites. Depending on where you are looking for work, there are many different types of summer farm jobs. 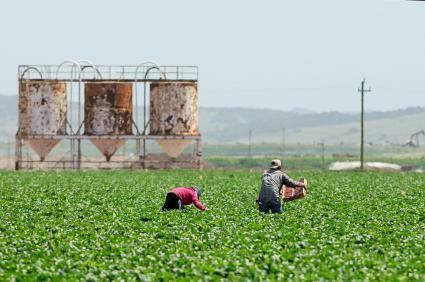 Large farms employ seasonal workers to spray and harvest crops. The type of crop depends upon the part of the country where you're seeking work and the time of year. Field workers often live in barracks or small houses on location, and the hours are long. You must be physically fit and willing to work long hours. Many jobs require a driver's license, and experience driving farm equipment such as tractors and other large field equipment is a plus. Many small farms run farm stands and Farmer's Markets. Seasonal farm workers are often called upon to bring produce to the market and they may be asked to manage the stand. If you're working for a small farm, you may find yourself setting up tables and tents to help sell the farm's produce. While not technically a farm job, learning about the entire distribution chain from seed to table is an important part of learning about farming, and these are good skills to learn through a summer job. Ranches throughout the United States often need summer workers to handle, care for and mark animals born in the spring. Sheep, cattle and horse ranches often need seasonal help to care for animals. Large animals need regular hoof trimming, deworming and vaccinations. Animals intended for consumption, such as cattle, must be marked with a tag or brand and tracked from birth to slaughter to ensure the safety of the food supply and compliance with federal law. Farmers often need extra help on large ranches to tag animals and track them. Ranch work also requires long hours, a strong physical constitution, and the ability to work with animals. Another type of seasonal farm job is part time work on a dude ranch or farms open to the public. Such 'agritourism' businesses see an increase in activity during the summer months when visitors wish to experience farm life first hand. You may find work leading tours, helping in the fields and vegetable gardens, grooming and feeding animals or any of the many tasks needed to keep a farm running. Summer camps may not seem like farm jobs, yet many riding stables and horseback riding camps need seasonal workers. Many camps bring their horses in from other locations just for the seasonal surge in campers and riding tours. This increase in usage means that the camps often need more grooms, barn help, trainers and teachers to assist with the camps and lessons. Summer farm jobs with horses may include mucking (cleaning) stalls, grooming horses, helping with veterinary tasks, cleaning tack, assisting with horse shows and mending fences. If you know how to ride a horse, you may be called upon to school or train young horses, exercise horses not being used consistently or teach young campers how to ride. Check camp guides and camp jobs for these type of farm jobs. No matter what summer farm job appeals to you, there are a few things you need to know. First, farming is physically demanding work, and you must be physically fit for most farm jobs. Some jobs such as running a booth at a Farmer's Market may not be physically demanding per se, but standing outside in the hot sun to sell tomatoes can be tiring. Always take safety seriously whether you are working with machinery, animals or even plants. Understand safety precautions for the type of farm work you've chosen. If you're working around large animals, remember that they can be unpredictable, despite their cute appearance. To find summer farm jobs, check your local feed and tack store, farmer's cooperative store or any store selling farm equipment. Many have bulletin boards where local businesses can post help wanted notices. Check newspapers and online job hunting sites like Indeed.com too. Whinny.org offers summer jobs and other jobs with horses. Pick Your Own provides information on summer farm jobs. Back Door Jobs offers many sustainable living jobs and apprenticeship programs. Research each to find one appropriate for your interests. Full Belly Farm is just one of many private farms looking for apprentices and summer workers.